These three taxa were named by Mourer-Chauvire (1987) for the inclusion of various modern-type Strigiformes from the Quercy fissure fillings, and were considered stem group representatives of the Tytonidae (see Fig. 8 in Mourer-Chauvire 1987). According to Mourer-Chauvire (1987, 2006), the Necrobyinae include the taxa Necrobyas, Nocturnavis, Palaeobyas, and Palaeotyto. All major limb bones of Necrobyas were described by Mourer-Chauvire (1987), and the following species were recognized in the taxon by Mourer-Chauvire (2006): N. rossignoli Milne-Edwards, 1892 (late Eocene), N. harpax Milne-Edwards, 1892 (early Oligocene), N. edwardsi Gaillard, 1939 (late Oligocene), and N. medius Mourer-Chauvire, 1987 (from deposits of unknown age). Mourer-Chauvire (2006) further listed N. minimus Mourer-Chauvire, 1987 (early Oligocene) in the Quercy avifauna, but this species was synonymized with Prosybris antiqua (Milne-Edwards, 1863) by Mlikovsky (1998a), an action with which Mourer-Chauvire (1999a) agreed. P. antiqua is otherwise known from the early Miocene of France, and a tentative record also comes from the early Oligocene of Belgium (Mayr and Smith 2002a). The species of Necrobyas agree with the Tytonidae and differ from the Strigidae in that the coracoid has a wide procoracoid process and an acrocoracoid process without pneumatic foramina, the proximal end of the humerus bears a marked transverse groove, and the proximal end of the tarsometatarsus lacks an ossified supratendinal bridge (arcus extensorius) (Mourer-Chauvire 1987). All of these features are, however, likely to be plesiomorphic for the Strigiformes, and in contrast to the tarsometatarsus of crown group Tytonidae, that of Necrobyas is rather short and stout. N. edwardsi is about the size of a Southern Boobook (Ninox boobook); the other species are slightly smaller. Two large owls from unknown localities of the Quercy fissure fillings were described as Palaeotyto cadurcensis and Palaeobyas cracrafti by Mourer-Chauvire (1987). The former is known from a coracoid, and the latter from a tarsometatarsus; Mourer-Chauvire (1987, p. 111) considered it possible that these bones actually belong to a single species. The coracoid of Palaeotyto is characterized by a straight acrocoracoid process which shows little medial deflection, and a long foramen for the supracoracoideus nerve. The tarsometatarsus of Palaeobyas is very robust and the distal end is only slightly curved across the trochleae; as noted in Sect. 15.1, the proportions of this bone resemble those of the tarsometatarsus of the Paleocene Berruornis. The taxonomic status of P. cadurcensis and P. cracrafti and their classification into the Necrobyinae need to be verified with further material. A smaller species of the Necrobyinae from the late Eocene of the Quercy fissure fillings, Nocturnavis incerta (Milne-Edwards, 1892), is known from humeri only. 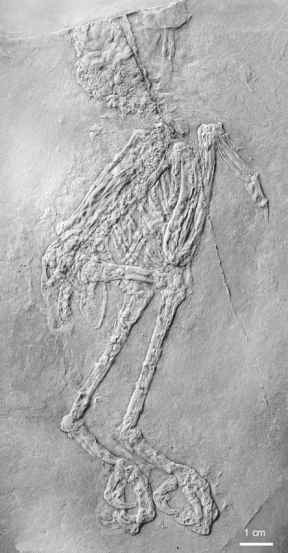 The Palaeoglaucidae include Palaeoglaux perrierensis Mourer-Chauvire, 1987, which is based on several limb and pectoral girdle bones from late Eocene (MP 17) deposits of the Quercy fissure fillings, and the middle Eocene P. artophoron Peters, 1992 from Messel, of which two postcranial skeletons were identified (Fig. 15.1). The specimens of the Little Owl (Athene noctua) sized P. artophoron constitute the only articulated skeletons of Paleogene owls described so far, although Olson (1985, p. 131) mentioned "several complete and perfectly preserved skeletons of a small species of owl" from the "middle" Oligocene of Wyoming. The Quercy species P. perrierensis differs from the species of Necrobyas in a more globular ventral condyle of the humerus and the presence of pneumatic foramina in the acrocoracoid process of the coracoid. The latter feature is shared with crown group Strigidae. 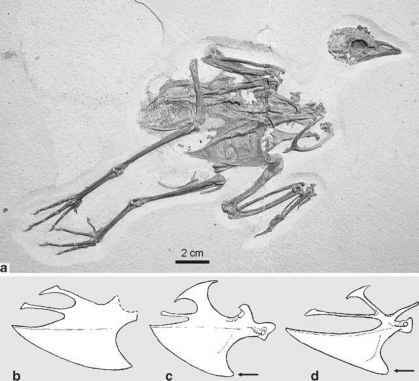 The Messel species P. artophoron is, however, distinguished from all crown group Strigiformes by the plesiomorphic absence of an osseous arch on the radius (see Fig. 4 in Peters 1992), whose presence is a characteristic derived feature of modern owls. The proximal phalanx of the second toe is not as strongly abbreviated as in strigid owls. Unfortunately, comparisons between the Messel owl and the Quercy specimens of P. perrierensis are limited owing to the fact that most bones of the P. artophoron specimens are crushed; whether this species is indeed a representative of Palaeoglaux thus needs to be verified by future specimens. Peters (1992) noted "ribbon-like" feathers in the holotype of P. artophoron, which were assumed to be an autapomorphic feature of the species, possibly reflecting an ornamental plumage. However, a similar type of feather preservation is found in other birds from Messel and may possibly be caused by the fact that only the feather shafts are preserved. The holotype and only known specimen of Selenornis henrici (Milne-Edwards, 1892) is a distal tibiotarsus from an unknown horizon of the Quercy fissure fillings. The species was assigned to the monotypic taxon Selenornithinae by Mourer-Chauvire (1987) and is of a size similar to Necrobyas rossignoli. From the "middle" Oligocene of Mongolia, Kurochkin (1976, p. 79) mentioned a "complete tarsometatarsus of a small owl, differing markedly from all recent forms of Strigidae"; this specimen still awaits formal description. Pellets, which possibly stem from owls, were found in the late Oligocene of Enspel in Germany (Schweizer et al. 2006).